A new effective way to supplement magnesium levels by using magnesium oils, gels and lotions Transdermally, i.e being absorbed through the skin. 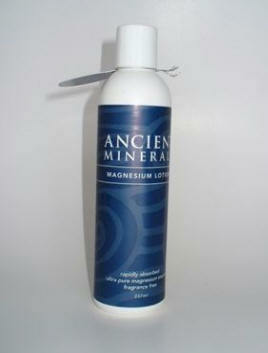 Ancient Minerals Lotion is a NEW addition to the world famous range of pure magnesium chloride, sourced from deep underground rather than ocean/lake waters which can be contaminated with heavy metals. 1/3 the magnesium strength as the spray on "oil" - 1g of elemental magnesium per 30ml.